Law Office of Karen Lee Dunne, Esq. | New York Estate Attorney, Estate Law Office: Suffolk, Nassau, Queens, Brooklyn, Manhatten, Bronx, Staten Island. 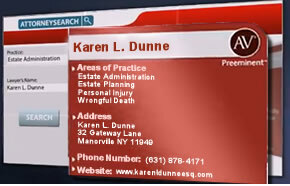 Karen L Dunne has specialized in all aspects of estate planning and administration for more than 25 years. She has the expertise, knowledge and compassion to be a dynamic advocate for all of her clients. Karen likens her practice to that of a family doctor from years gone by. She is willing to see clients in their own homes so that they are more comfortable and less intimidated by the legal system. In addition to her legal practice, Karen has dedicated herself to community service. She is proud of the work that she has done in the Eastport South Manor and surrounding communities and believes that the many hours of pro bono work she has performed have enhanced her ability to provide personal, professional and expert legal services to all her clients. "As a woman and a mother, I am pleased to know a woman is standing in the gap for my children. It is just different when a woman thinks about children. I thank you again for helping them do what I know is possible and that is not giving up on going after what is right." ~ Pauline H.
The estate, probate and trust law attorney, New York City, Manhattan, Bronx, Queens, Brooklyn, Nassau, Suffolk, Long Island, Westchester probate & estate attorney, estate administration & settlement lawyer, New York inheritance law & inheritance disputes, estate litigation, contested estates & trusts law office, estate planning lawyer, estate tax attorney, administering estates and trusts, probating wills attorney, estate tax returns, estate & trust accountings, executors & trustees, or other legal information presented at this site should not be construed to be formal legal advice nor the formation of a lawyer or attorney client relationship. 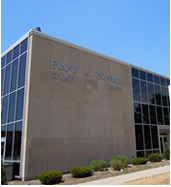 Any results set forth here were dependent on the facts of that case and the results will differ from case to case. 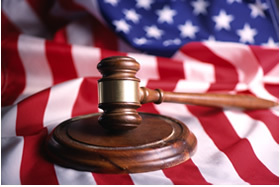 Please contact our New York inheritance, probate, trust and estate law office - New York, NY. Attorney Advertising.